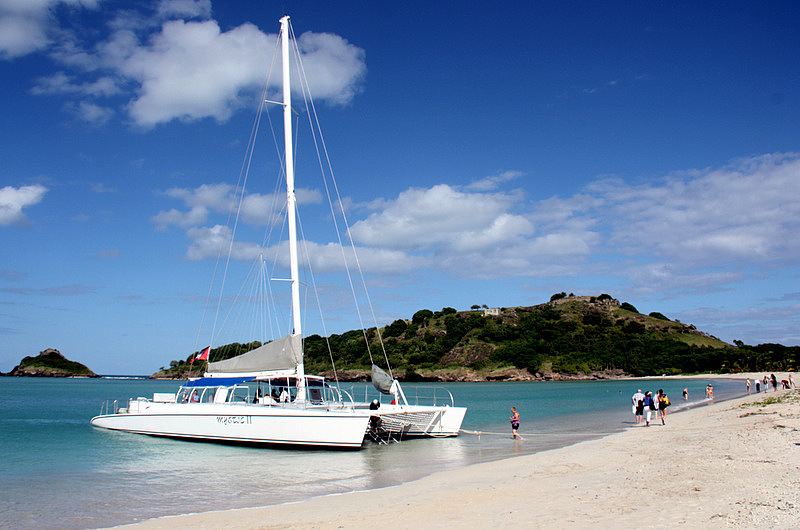 Antigua is a beautiful tropical island in the West Indies situated east-southeast of Puerto Rico. 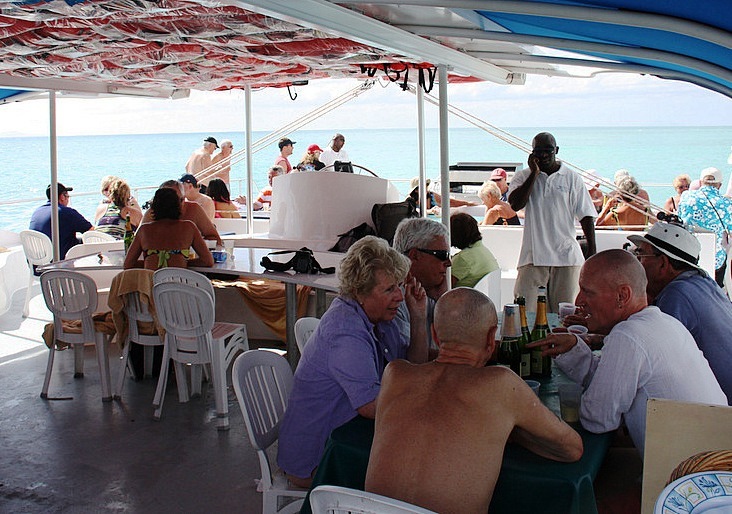 This is an isle with an assortment of extraordinary leisure pursuits for vacationers of all ages. 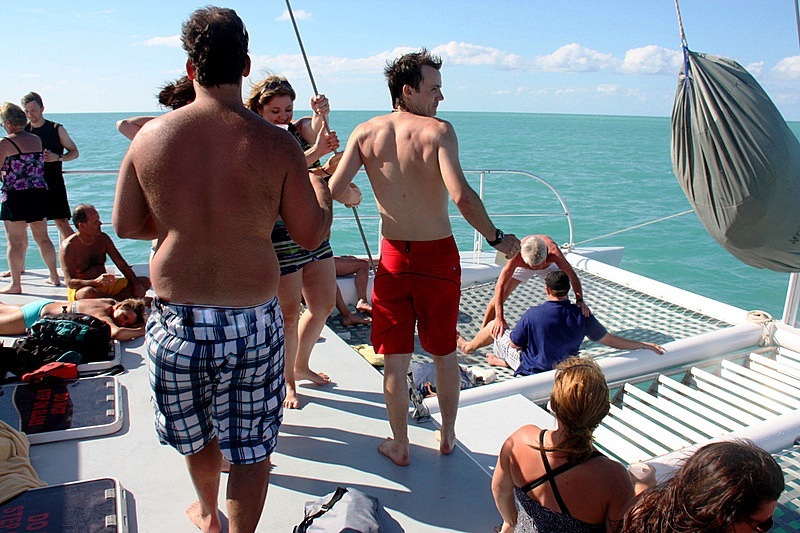 One fun activity worthy of consideration by every age group is an all-day catamaran cruise. 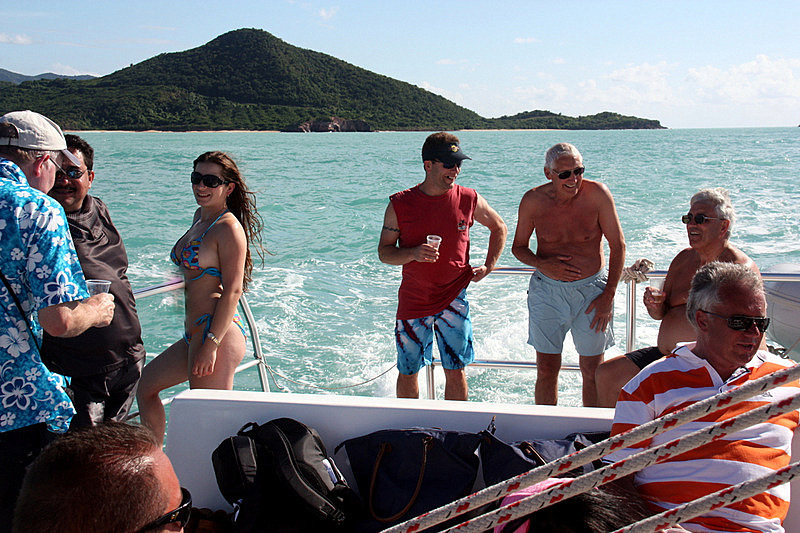 Here’s what we experienced when we signed up with Antigua’s #1 tour operator, Tropical Adventures. 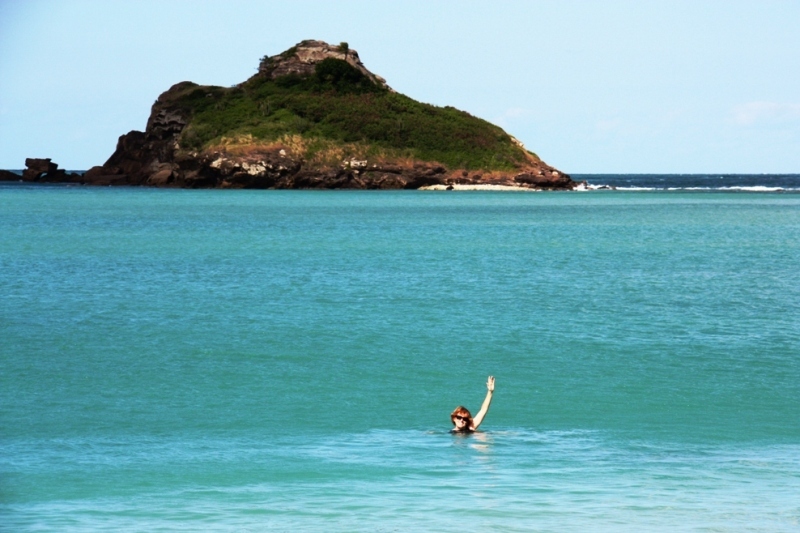 We had just arrived in Saint John’s, Antigua — it was hot, and we wanted to get wet. The promise of a remote sandy beach accessible only by boat was romantic and appealing. Picturing ourselves on the bow, with a gentle sea breeze wafting through our hair as we sailed to paradise was most alluring. The fact that a lobster lunch and beverages were included, and all we had to do was sit there and enjoy the experience – sealed the deal. It was a short walk to the Tropical Adventures office where we signed up for an all day adventure on the 65-foot catamaran “Mystic.” She was docked at a nearby wooden pier. The Mystic is quite roomy and can hold about 90 guests. 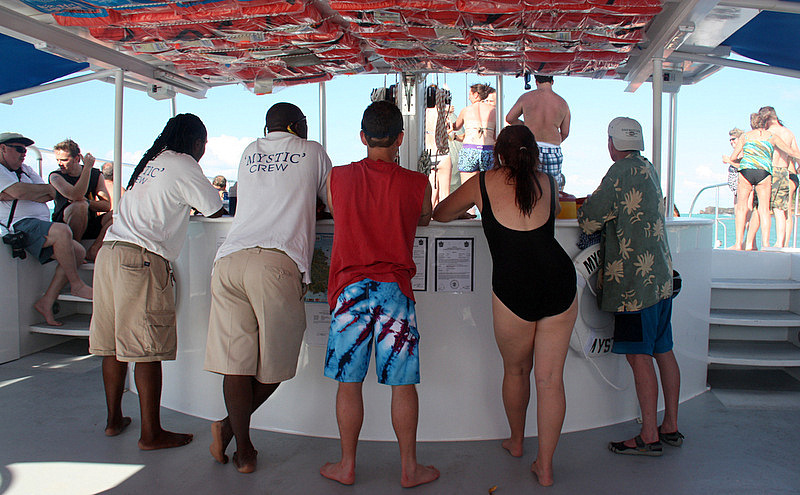 There are two bathrooms aboard, and the center of the spacious deck is dedicated to a well-stocked open bar. There were about 70 passengers aboard our excursion. 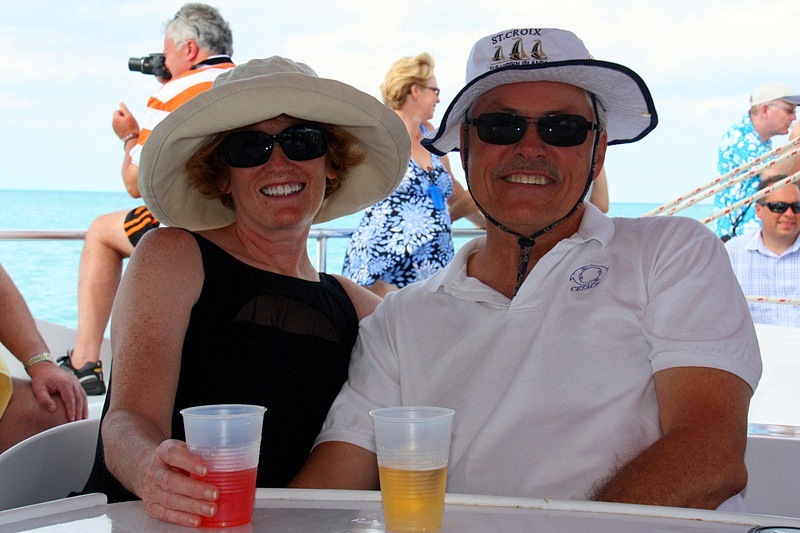 Our fellow sailors hailed from a mixed bag of island accommodations including vacation rentals, hotels, and several cruise ships. Ages ranged from the low 20s to the mid-80s. We wondered how the mix would influence the outing. We did not know any of the other passengers and that appeared to be true of most of the guests. 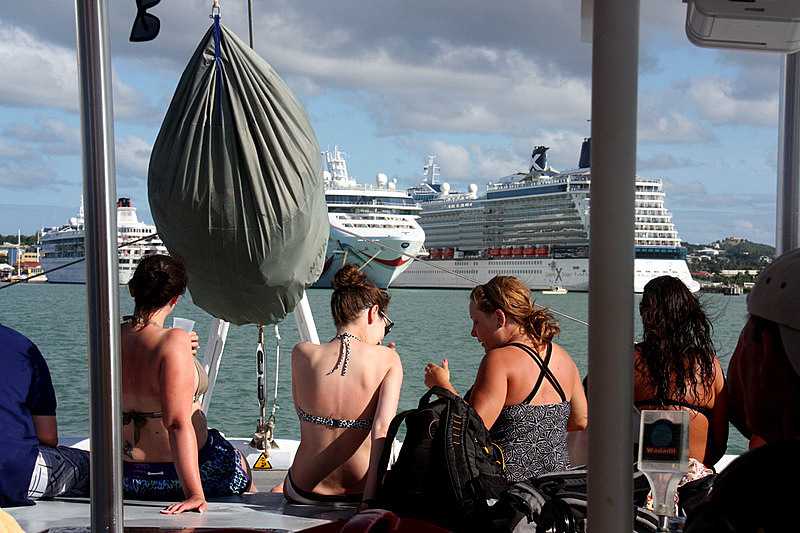 On our outbound sail, people kept to themselves as they enjoyed the warm tropical sun and sea. After about an hour of passing small islands with flowing palms, we approached a charming cove with a white sandy beach and the absolutely clearest turquoise water. Our captain pulled the Mystic close to the sand and we all waded ashore. The passengers stayed with their familiar groups and took off in all directions to enjoy beachcombing and swimming in the warm and inviting ocean. 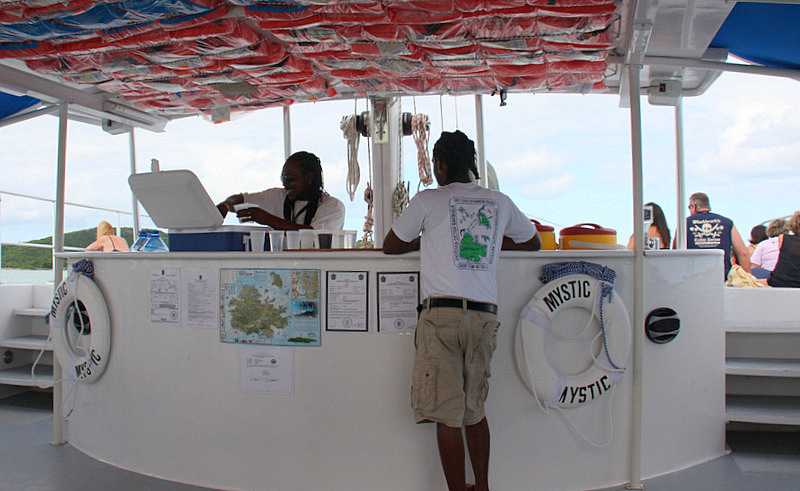 For those interested in snorkeling, the equipment was available aboard the Mystic at no extra charge. Just when we started to get a little hungry, the Mystic crew enticed us back to the boat with the promise of grilled lobster and champagne. One by one, the passengers returned from their swimming and shore explorations. Once aboard they selected places to sit and have lunch. The crew did a marvelous job of passing out the lobsters and corn – and champagne. Within the hour, everyone had their fill of food, but apparently not – champagne. As the Mystic pulled away from the beach, a metamorphosis overcome the guests. The heretofore-soothing island music seemed to grow in dimension and volume, and there was a definite repositioning of people on the deck of the boat. Energized by champagne and a delicious rum punch, some of the younger folks began to strut their limber stuff on the makeshift dance floor in front of the now busy bar. This was followed by somewhat older passengers and the merry Mystic crew engaging in a limbo contest upon the bouncing sea. 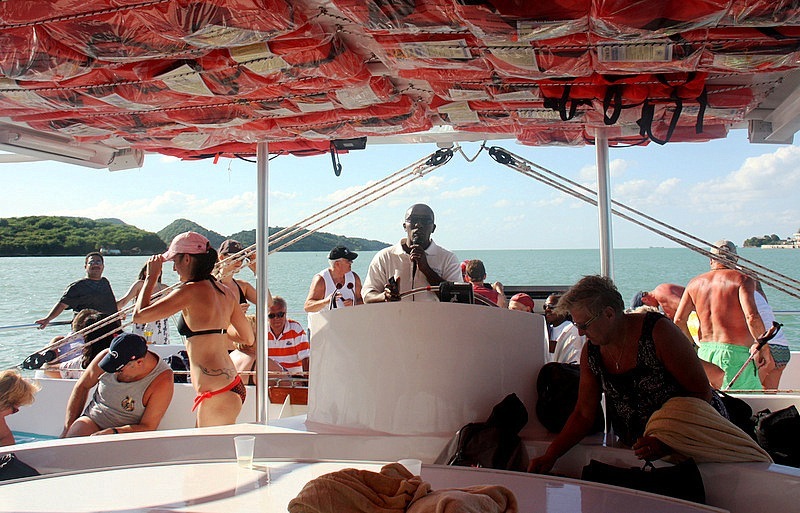 Captain Excellence was born in Antigua and revels in his job on the Mystic. 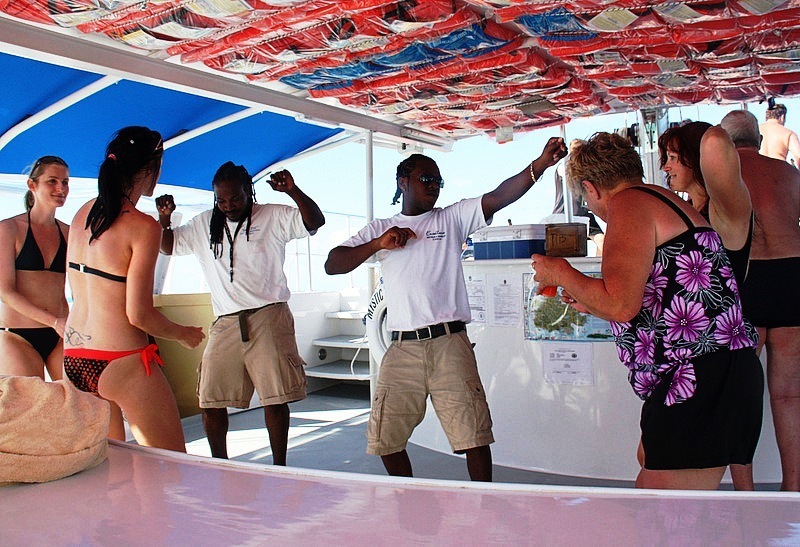 Beer began appearing alongside the rum punch cups that covered the bar, tables, seats, hatch covers, and deck. Water, fruit punch, and soft drinks were also available – but not in great demand. Some elders found a loose case of champagne among the empties, and were happy to share their bounty with their juniors. Smiles turned into laughter, and quite miraculously, everyone seemed to find long lost friends across generational lines. All over the boat, new entrants to ongoing conversations were greeted with handshakes, hugs and hearty slaps on the back. Before long, we were back at the Mystic dock. The roughly 6-hour day sail had ended all too soon for everyone on board. 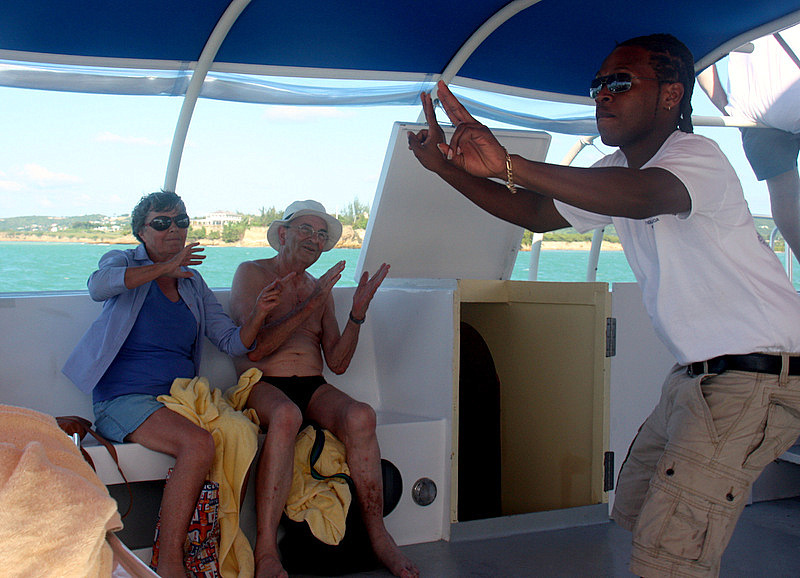 As the passengers carefully disembarked the boat, they all gave high-fives and tips to the wonderful Mystic crew. On our slow and cautious walk back to the Silhouette, we could hear our fellow Mystic passengers singing the now familiar tunes that we shared all day. In fact, we could hear them singing in the passageways of our cruise ship throughout much of the early evening. 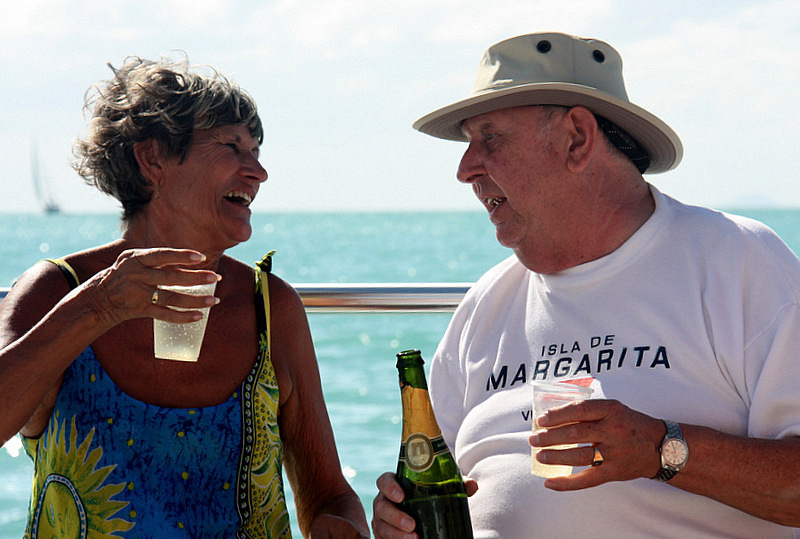 We just smiled – along with the other 50 or so new best friends that we met on the Mystic. This tour is definitely worth the price of admission. Be sure to bring a swimsuit and camera. 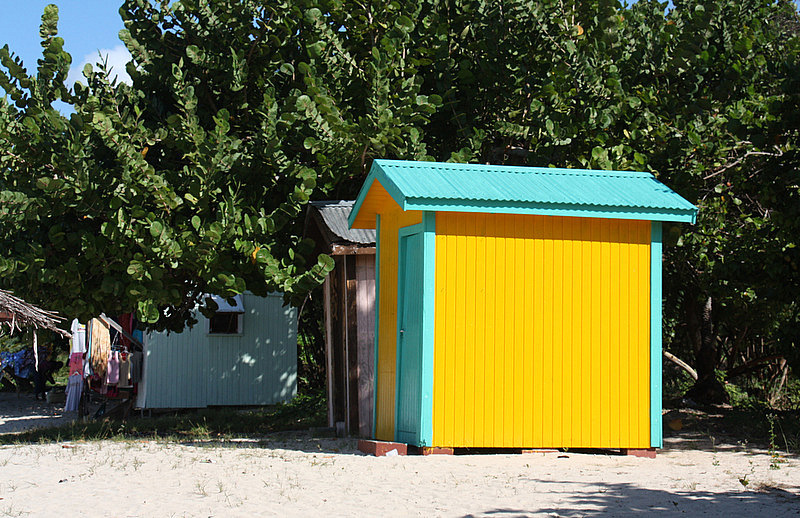 Here is a list of other Caribbean stories written by the authors. Click on the title to read the article. 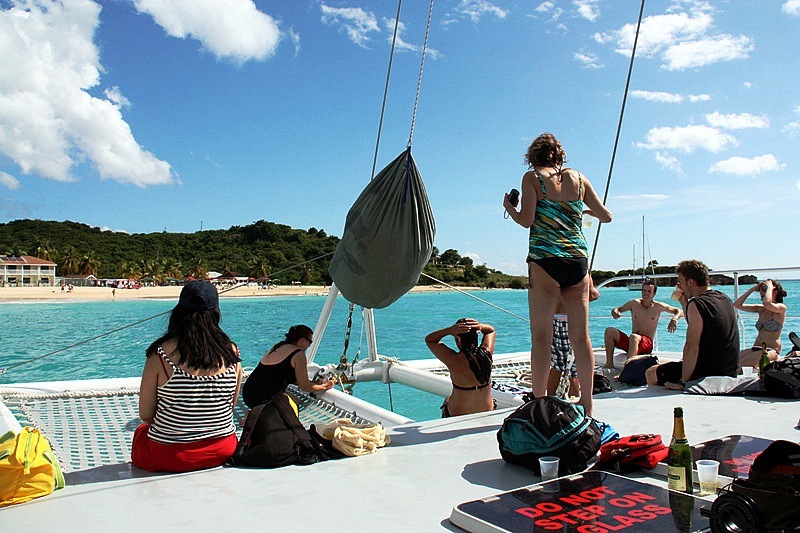 This entry was posted in Windjammers and tagged Antigua, Best of Antigua Sailing, Mystic Cat, One Day Sailings, Sailing Catamarans. Bookmark the permalink.